Were you as obsessed with the first season of True Detective as I was? While S2 wasn't quite as fantastic, I know most of us are still rooting for a third season. 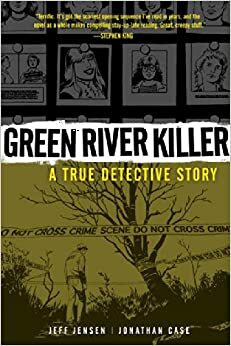 In the meantime, pick up a copy of Green River Killer: A True Detective Story by Jeff Jensen and Jonathan Case. This true crime tale brings us the story of Gary Ridgeway, famous for his string of murders not far from Spokane. In True Detective fashion, the story goes back and forth over 20 years between viewpoints and tells a riveting story about both the murders and the detectives tracking them. Goodokbad.com calls it "deliciously good," adding that "the tension and drama...[are] exciting and satisfying." Goodreads.com ratings put it at 3.8/5 and it comes promoted by masters Stephen King ("scariest opening sequence I've read in years"), Brian K. Vaughan ("exquisitely paced visual storytelling"), Gillian Flynn ("a chilling, unnerving story with sharp bursts of humor"), and many more fantastic authors.